The wonderful thing about Valentines Day is that the smallest of gestures can make the day so special. A hand-written note with a "little something" can make our day. I gave up on fancy dinners in crowded restaurants ages ago in favor of sushi in our favorite little place with our daughter and finally found a Valentines Day tradition I can remember forever. For all the other Valentines in our lives -- the friends, kids' teachers, sisters and mothers here are a few "little somethings" that will brighten up their day without breaking the bank. 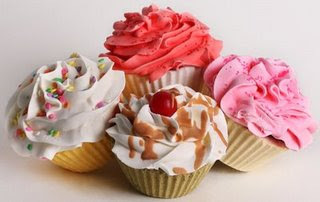 These delightful cupcakes are one of our most popular gifts and are the perfect gift for Valentines Day. Just drop in the bath for a fragrant & foamy experience. Choose from Sweetie Pie (with hearts!) Lemon Fluff, Oh Honey, Fruit Sorbet, Creamy Vanilla & Cotton Candy. 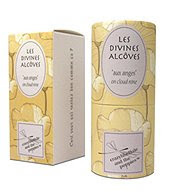 "aux anges" - On Cloud Nine: top notes of Bergamot & Ylang-Ylang, heart note of Jasmine, base notes of White Flowers. 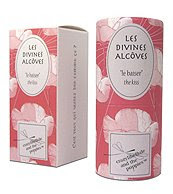 "le baiser" - The Kiss: top notes of Bergamot & Jasmine, heart notes of Iris, Rose & Violet, base note of Sandalwood. "amoureuse" - In Love: top notes of Berry & Black Pepper, heart notes of Rose & Black Tea, base notes of Musk, Vanilla & Sandalwood. "dans tes bras" - In Your Arms: top notes of Bergamot & Jasmine, heart notes of Iris & Violette, base notes of Sandalwood & Vanilla. Finally, our Melange custom blend formulated in honor of the day celebrating Love. Valentine 126 : Top notes of Guava & Vanilla, interlaced with warm Gardenia & Tuberose flowers and a base of Dark Chocolate and Tonka Bean. Perfect for a roller parfum ($18) or Body Creme ($22). Made to order, of course. It's January! 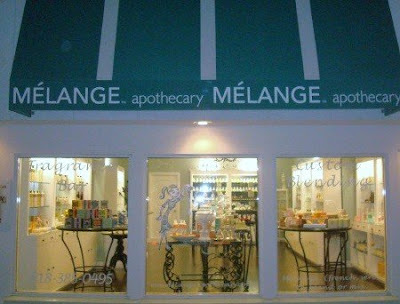 Must be time for the Melange Apothecary Semi-Annual Sale... Now through January 30th. Take 50% off all seasonal merchandise by Gianna Rose, Thymes, Rosy Rings.